I do not have much to add about this song so I stitched some photos and video clips, mostly from Huntington, almost all from Long Island, and all from my own photos. This project has not been nostalgic enough for you, you say? Needs to be more sentimental? Well, here you go! Billy Beard on drums. 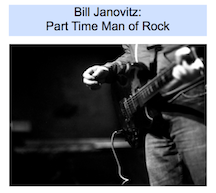 Scott Janovitz recorded him. 1-2. Shots from the Amtrack train home to Boston. 21. My grandparents and their friends, probably the Poconos. 26. Reunion: Eddie, Brendan, me, Dan. 56. Our street and house from 1979-1982.